Time spent with Old Man’s Journey is time spent in meditative reflection. There’s nothing frantic or urgent or anxiety-inducing here, and I found that change of pace very welcome indeed. When we first meet the old man of the title, he’s in a contemplative mood, gazing out to sea from his quaint little house. From there, he sets out on a journey: initially, we’re not sure of his reasons, but as the player, you must guide his meandering footsteps as he travels through towns and over vast countryside to reach the journey’s end. You do this by reshaping the landscape ahead of him, literally moving mountains, hills, and valleys to allow previously obstructed terrain to become passable. This is achieved elegantly with the unobtrusive interface: you simply use the mouse to click and drag layers of 2D scenery up and down. A bunch of yellow lines appears as you grab onto the terrain, letting you see where each piece intersects, and so where the old man will be able to travel. As you can’t move a layer that he’s standing on, you often have to shuffle him around from one piece to another while you do your creative best to forge the path ahead. It’s pretty simple stuff, and while the puzzling does get a smidge more complex as the game progresses (later the timing of your scenery movement becomes key), it's clearly designed mainly as a fun pastime—busywork while the game imparts its gentle story onto you. And I was definitely on board with this approach, largely because the game-world developer Broken Rules has created is so incredibly gorgeous that it’s an absolute joy to be a part of, whatever you’re doing. The colorful, entirely hand-drawn art style is never less than utterly charming, with each scene seemingly designed to have the impact of an exquisitely detailed watercolor. Nowhere is this more obvious than in the little memory vignettes that pop up every now and then. These largely static moments from the old man’s past appear when his memory is jogged by something in the present, filling in his backstory piece by piece. Each of these illustrations is to be savored: I’ve seldom seen such sheer beauty in a game. There are plenty of emotionally affecting moments as the old man’s journey runs its course, some large, some tiny and fleeting, and for the most part, each of these landed with me. Often they come from those memory vignettes but sometimes arise from brief interactions between the old man and the characters he meets along the way. The folksy orchestral score, present throughout, also contributes significantly to those meaningful emotional moments. There’s payoff at the end, too, which I did find genuinely poignant. If you’re after something action-packed, well I’m surprised you’ve made it this far into the article. Old Man’s Journey ambles along at a steady pace, taking its time to show you some moments of pure loveliness along the way. Sure, there are minor annoyances, like when the camera is too eager to move to a new scene before the old man can keep up, leaving him obscured behind the scenery. Or when certain elements of the landscape aren’t quite as responsive as they should be. The irritations are few, though. 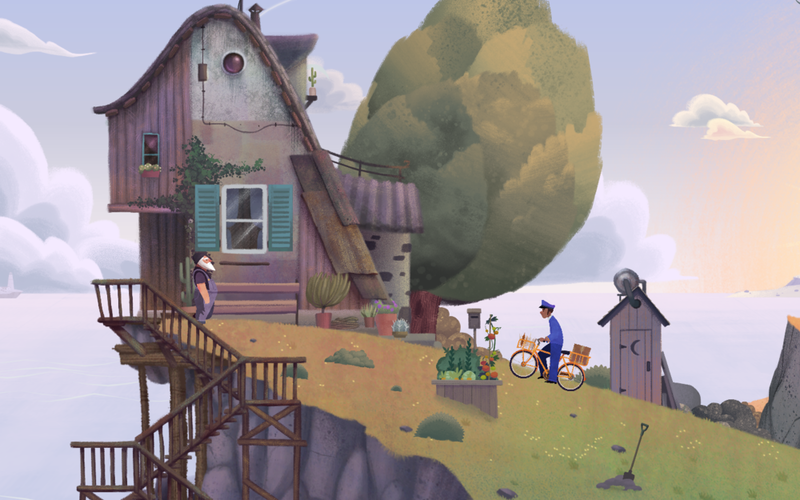 Mostly, Old Man’s Journey is simply a delight.